Wednesday, August 12: After a night of violent thunderstorms (a regular occurrence in summer in this mountainous region, it appears), we had yet another gorgeous, sunny day for our next cycling adventure. The plan was to do something a bit flatter, given our Stelvio climb of the day before and our plan to ride the Sella Ronda on Thursday. I had worked out a route to take us along the Wine Street and the profile looked reasonable. Of course, the profile may have looked reasonable but once again we got seriously lost on the outskirts of Bolzano as the road markings did not make much sense. At one point we almost ended up in a very nasty tunnel on a limited-access highway but we managed to turn everybody around before we became traffic fatality statistics. As it was, the road we followed was quite busy but eventually we were able to get off of it and turn towards the west. 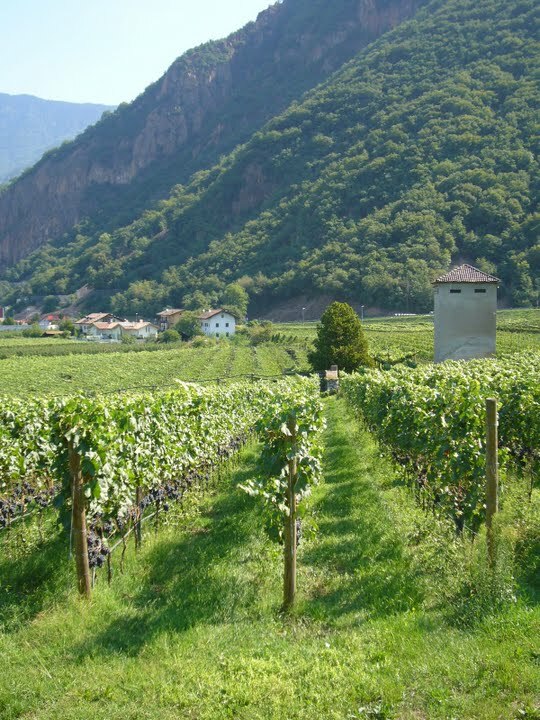 After crossing a small bridge we turned south and found ourselves on the Weinstrasse, according to the signs. This was good but to get to the Kaltern See, the lake on our route, we had to climb up and over the massive ridge parallel to the road we were on. With Stelvio-tired legs, this was not so easy as the 3 km climb included sections that were 16 percent grade. At the top we had great views of castle ruins, vineyards and the lake below. A quick downhill run brought us to a restaurant on the edge of the lake, where everyone thought we should stop for coffee and the inevitable strudel. It was quite hot by now, and it was refreshing to sit in the shade and watch people enjoying the grassy beach nearby. I was tempted to go swimming myself but instead we got back on the bikes and headed in the direction of our goal for the day, Trento. The road was very nice, but not really all that flat and I was beginning to feel tired between the climbing and the heat. We passed through the villages of Tramin, Kurtatsch and Magreid and approached Mezzocorona, which seemed to be a crossroads. We looked for a place for lunch but nothing was open so riding under the autostrada we came to San Michele all’Adige, which looked a bit bigger. After some searching in this totally dead village we did come across a restaurant that was actually open, although the menu was limited to three kinds of spaghetti. It was actually quite expensive compared to what we had enjoyed so far but we were all hungry. And feeling pretty tired. We asked about where we could find a train station and it turned out we had to return to Mezzocorona for that. 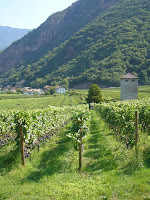 Taking a different road, we got there very quickly and soon a train arrived that took us back to Bolzano for $5 each. Although it felt like a lot more, we had climbed 524 m for the day, riding 64.52 km in all. We did make it quite to Trento but this was plenty for a “recovery” day. I always save up reading your posts for a Saturday morning while having my coffee. I feel as though I'm on a mini vacay, somewhere exotic. Thanks!